ISS is a leading global provider of facility services, offering Cleaning, Security, Property, Catering, Support and Facility Management. 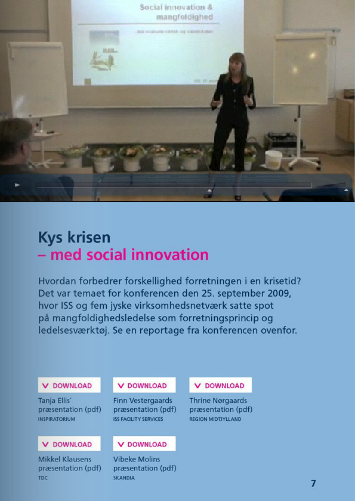 In the fall of 2009, Denmark’s largest facility services company, ISS, and five professional networks hosted the Danish conference “Kys Krisen – Mangfoldighedsledelse og social innovation“, Kiss the Crisis – about diversity management and social innovation. Tania Ellis was invited to give a talk on social innovation and diversity management as a competitive force in times of crises. – Malene Mikkelsen, Team leader, ISS Facility Services A/S.